Preacher - Hilter - Review: "Starr meets Gran'ma"
I keep mentioning this in my reviews but perhaps the greatest strengths of Preacher so far has been how good its villains are, to the point where someone like Hitler is treated as a minor character and it can make no difference at all to the overall plot-line (yet). 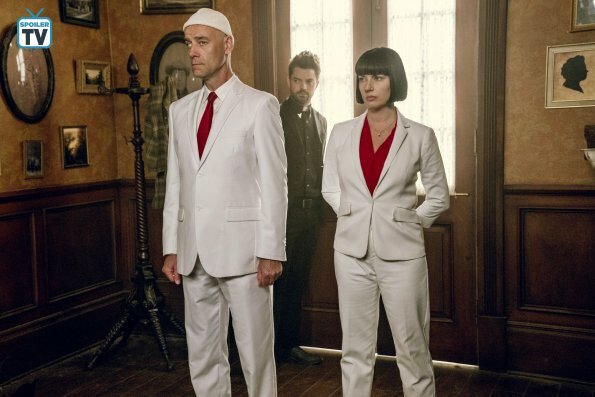 We have The Saint of Killers getting ready to start his revenge against Jesse Custer, we have Betty Buckley's fantastic Gran'ma, and we have Starr, the ruthless right-hand man of the Grail, and a brief cameo of the Allfather, all in the same episode. It's a variety of characters that shows how diverse the selection of villains is that Preacher can call forth should they so need. No one fight ever feels the same, and everything feels so incredibly fresh. Preacher spends the first few minutes introducing us to Hitler, who's going by the name of Hilter and working at a Subway, like everything is normal. 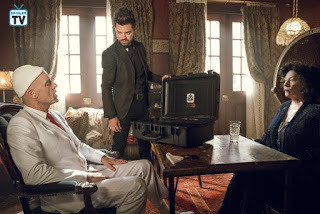 Noah Taylor makes the most of the character in the few appearances that he gets this episode - the surprisingly few appearances, I might add, given that he has the episode sort-of named after him, and the scenes between Hitler and Eugene are over before the opening credits begin, taken back to hell so that the Saint of Killers can get back in the game. As if this season wasn't bad enough for Jesse with the whole scheme to get Gran'ma what she wants whilst delivering a coup over the Allfather in the process, he will very soon be watching his back for what comes next. This episode felt like putting the pieces together for a final act, laying down the markers for what was to come. Once again, the shortened episode count is really paying dividends in this season as it allows for a much more constrained season and you get the feeling that there won't really be any filler episodes in the remaining three. There's presumably more in store for Eugene and Hitler, and the way that the episode carefully juggles all the respective threads is something to be admired. It's a crying shame that this show doesn't get more love, as arguably, it's the most overlooked television show on air at the moment. If not, the top 5 for sure. Cassidy's arc hit all the emotional notes that his needed to. His relationship with Eccarius is fascinating to watch unfold, and it comes as no surprise to see them kiss. It almost felt like we were watching a romantic comedy for a while, seeing them explore all the stuff that vampires traditionally do together. Of course it's not going to end well, and Eccarius is actually not who he appears to be, developing a hatred for vampires, killing those who he has turned. Will Cassidy suffer the same fate? One of the most enjoyable threads of this episode was seeing Tulip interact with Lara Featherstone on a more consistent basis after she was ordered to pose as a member of the Grail. Seeing them expand on the fallout of Lara's betrayal in Season 2 was fun to witness, and their back-and-forth throughout made the best of putting the characters in the same room for longer than both of them would wish for. But the far more important thing addressed in this episode was that Jesse is now on board with Starr's plan, and he didn't even have to kidnap Cassidy again to get him there. In exchange for getting Gran'ma some souls, he'll get Jesse on board for the coup, which he dismisses as some public relations business. Once again, this was some terrific acting by Betty Buckley who pretty much stole the scene this week. Her menacing portrayal of Gran'ma is just so good to watch unfold, and it'll be interesting to see what happens to her when she gains access to the "Soul Happy Go-Go", a repository located in Japan said to be heaven for souls. But the Robbery needs to be pulled off by Tulip, Lara and Jody (TC's flight suspension prevents him from going overseas). And Jesse and Starr need to take out the Allfather. The conversation between both Jesse and Starr was fun to witness in the calm before the storm, with Starr recognising the powers that Jesse would have once his soul was returned to him. He would have every right to betray Starr with Genesis and Starr would not be able to do anything about it. But "No matter what happens from here on out, I'm with you, Messiah," Starr says, representing the possibility of yet more delightfully entertaining team-ups to follow. What did you think of Hilter? 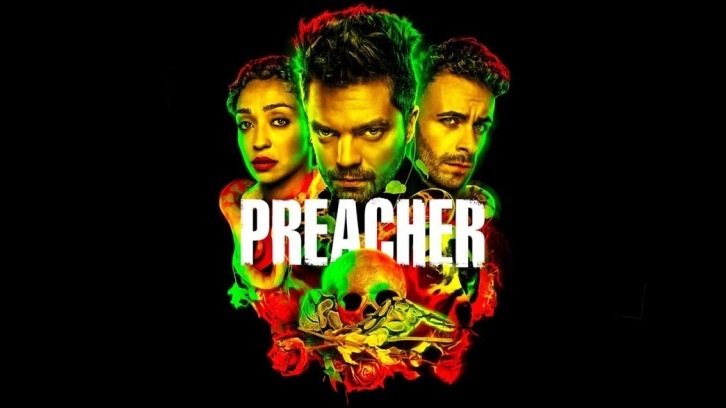 Let me know in the comments below and be sure to check out the next episode of Preacher, airing this Sunday on AMC.